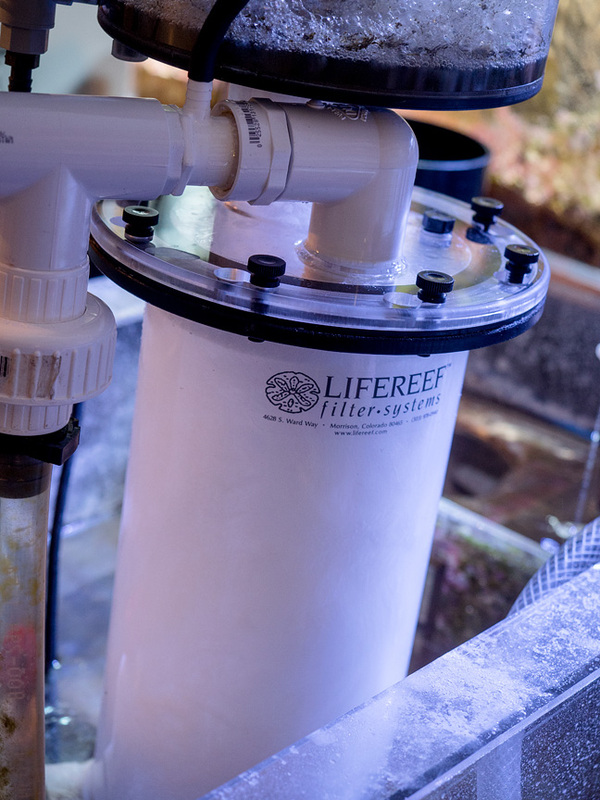 There seems to be a club thread for every other major skimmer, so why not Life Reef? Ever since I got mine there seems to be more and more threads popping up so I figured we could have one common thread for pics, questions, reviews, etc. The following is from my build thread post, here..
Ok ladies and gents... for summer 2013 the fish room is undergoing some changes/upgrades. 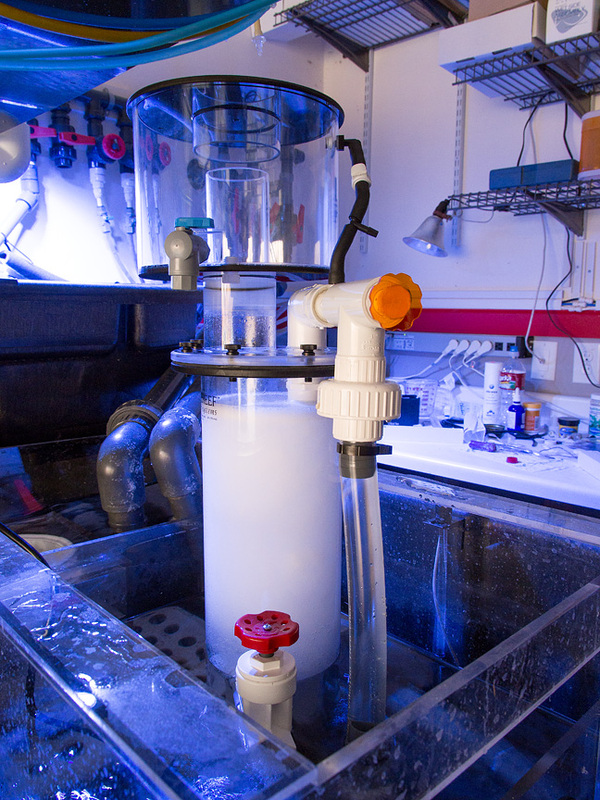 Here is Part 1... new protein skimmer! No more cones, no more needle wheels, no more new fads, no more hassles! d2mini is going old skewl with the tried, true and relatively unchanged LifeReef SVS3-30 venturi skimmer. Just got it a few days ago and first impressions are good! I'm coming from a Vertex Alpha 250 so that is my comparison. 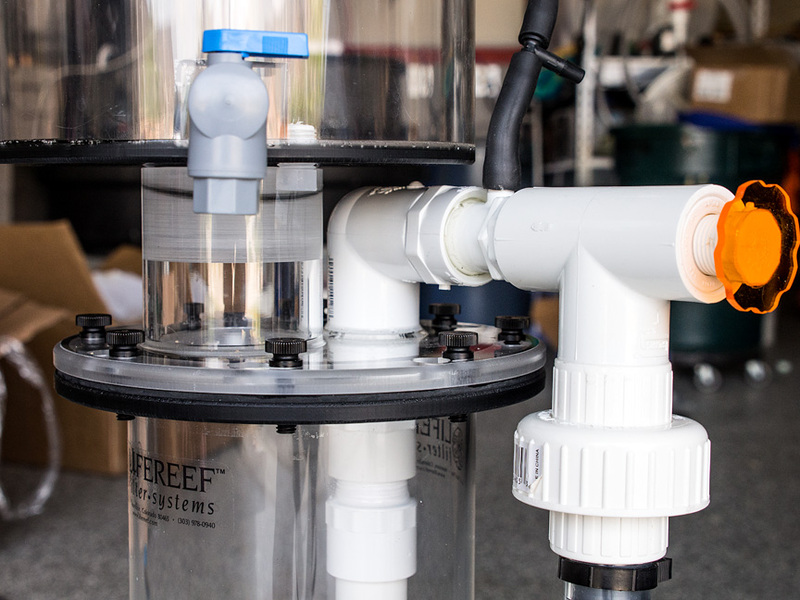 I can say that this LifeReef skimmer is built very well, easy to assemble, and it so simple... just one knob to adjust! 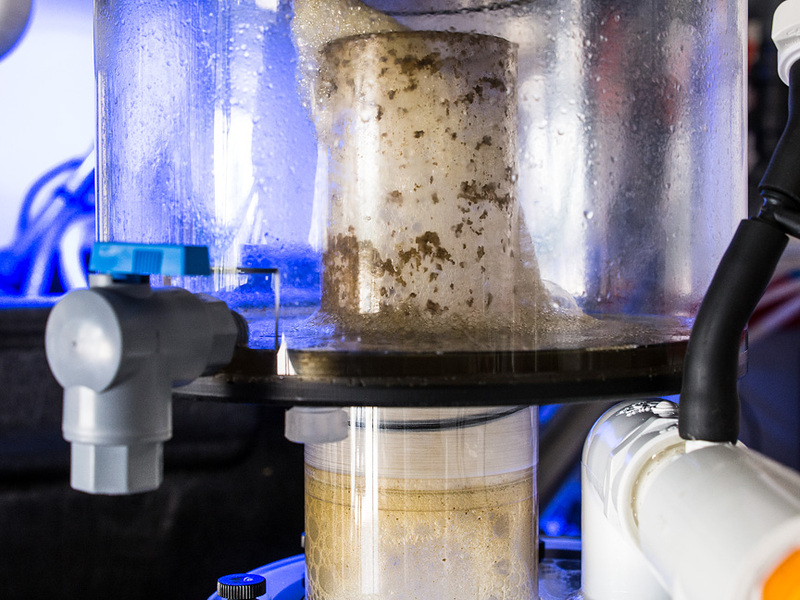 All you do is set the water height inside the skimmer body using the gate valve and walk away. This is the only thing that ever needs adjustment. No more balancing acts. Even the water height in the sump is not part of the equation. Just make sure it's below the output of the skimmer. It took just over 12 hours for the skimmer to start producing foam in the neck... quicker than expected. 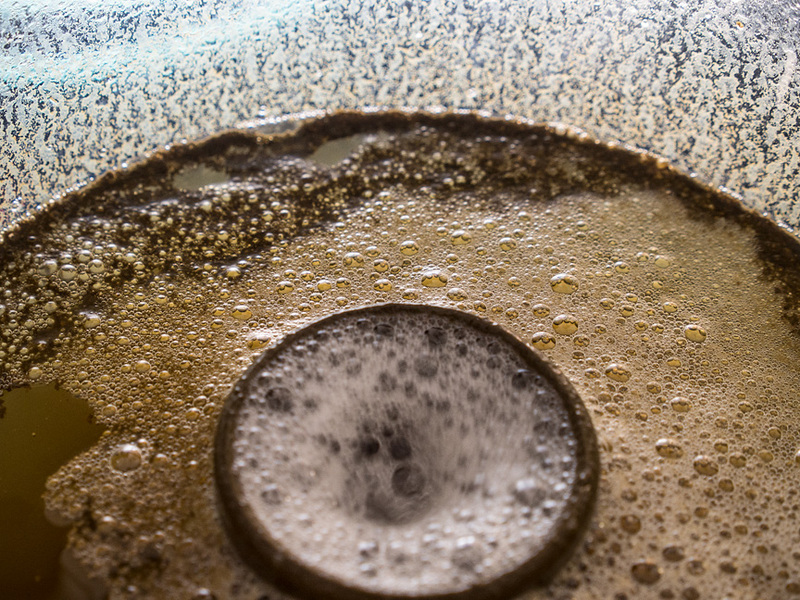 Within 24 hours I already had a solid 1/4" of dark skim in the 8" diameter collection cup. I also had the ozone kit added (another Summer of 2013 upgrade coming soon). Two great things about using ozone with this skimmer. 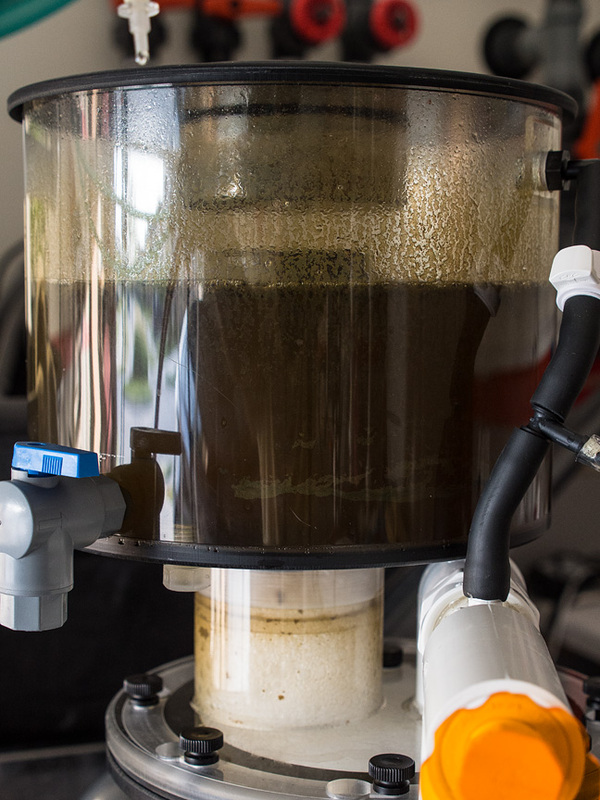 For one, the contact time in this skimmer is longer than most other skimmers. 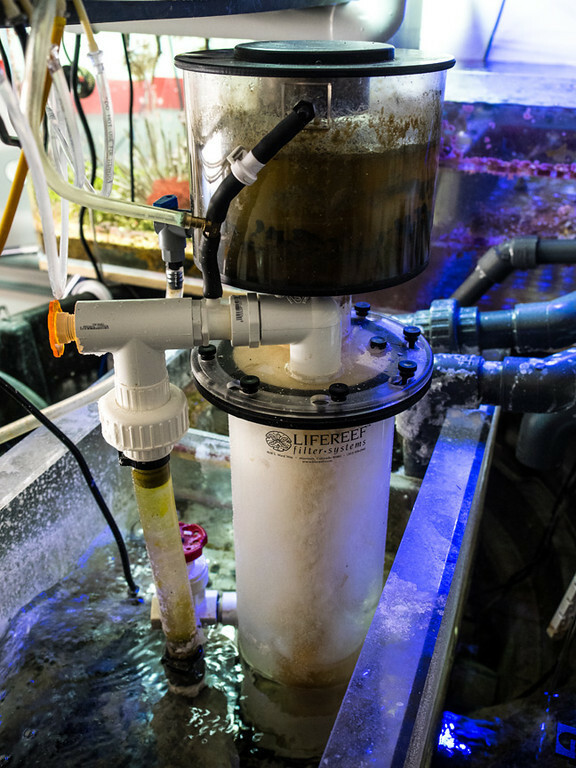 Second, any unused ozone is reintroduced back into the skimmer. None of it escapes out of the collection cup. 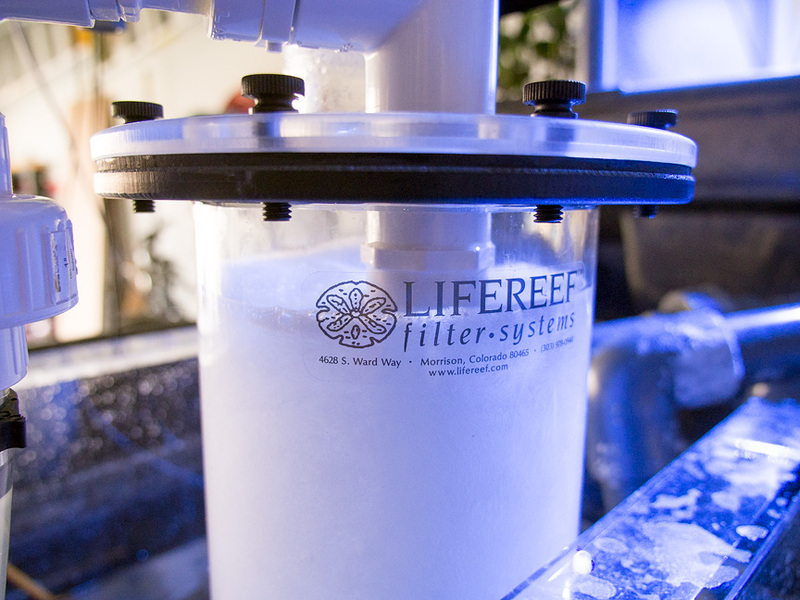 So far my new LifeReef skimmer has been making skim for less than 36 hours. So more comments to come as I get to know it better. But so far I am impressed, not only with the skimmer but the man behind it. Jeff was real easy to work with both on the phone and through emails and seems to make a real quality product and backs it up with great customer service. Meanwhile, here are some pics. Out of the box, hooked up and running, first foam in the neck and finally a shot of that dark black poo. Look at all this fish poo! That's all the junk my giant cone skimmer was leaving in my tank! This was the first 6 days of skimming. Got it last friday afternoon and it didn't start foaming until late saturday morning. Ended up being 2.5 quarts (over half a gallon). This is the latest pic i have. It's been like 10 months or so and the skimmer hasn't missed a beat! Very nice update with pics. LifeReef is tops on the list to switch whenever I decide to do so. Is that tee in your last pic on the airline for your ozone? What manner is the collection cup fastened to the body? Here's my 48". Pay no attention to the height of my intake plumbing I am lowering this after my post. This is about 36hrs running since I cleaned the skimmer Tuesday evening. I clean my skimmer every 2-3 months, don't know why I just do it. The way it is set up now keeps the venturi clean. No clogging, no maintenance, no muss, no fuss! d2mini, what's the tee with the orange knob for? I'm not sure why he got all fancy with the orange knob, but that's just a threaded cap so you can get in there and clean it out if you ever need to. I haven't yet. Good idea. I thought it was an adjustment for the water inlet off the pump. That is the claim, and is true without the ozone "tee". With the tee there, it is also drawing "dry" air. How do you know where air is actually being pulled from with the tee there? 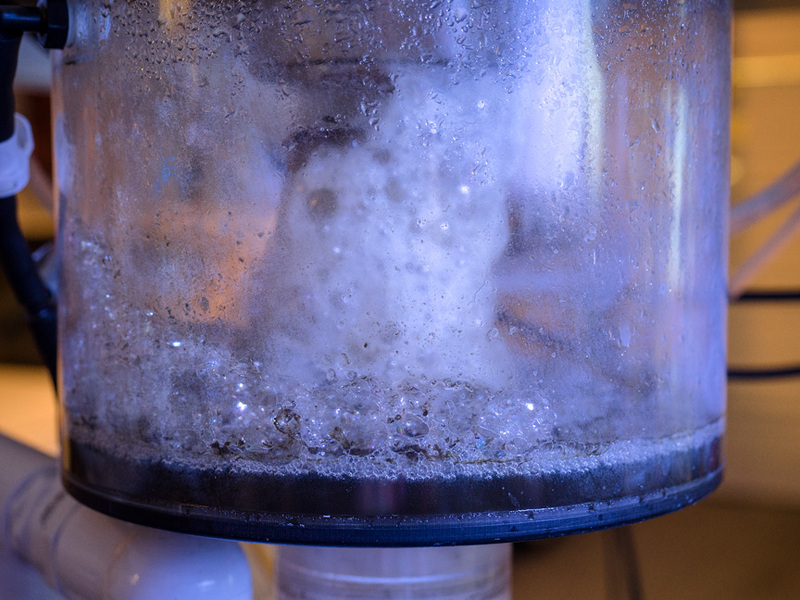 Or is it drawing from both ozone and cup, and the injector just sees "less" humid air? You'd have to speak to Jeff to answer those questions. All I can tell you is what I posted earlier... that the skimmer hasn't skipped a beat. ^^^^ +1. Has not missed a beat yet. I started out with Lifereef in 1994 with a VS-24 and have had 2 more since! I am currently running a VS3-30 external. I still have a pretty small bio-load since it is a new build but its pulls black gunk consistently. I really like having the flexibility to change this to in sump or change the pump to pretty much any one I want to use. Years ago on another build, I had a VS3-48. the photo attached is when I first turned it on and wasn't even dialed in. It was on sump full of curing live rock and It was pulling gunk instantly. I have ran other quality cone skimmers- I admit I got caught up in the hype and wanted to try it. I went back to Lifereef. Current Tank Info: 300 DD, Bubble King Supermarin 200, Kessil + T-5 Lighting. 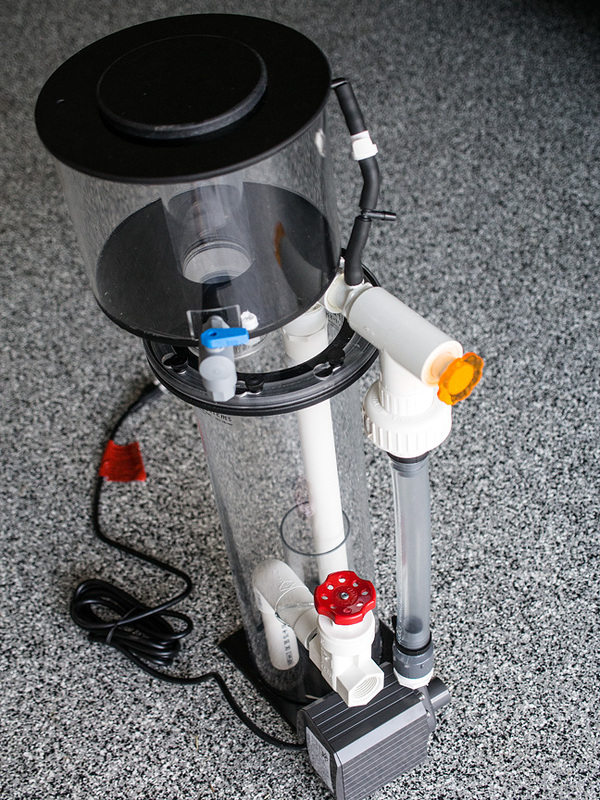 What water depth do you guys have the skimmer sitting in? My 48" is in 10" of water. Thanks. Is the output pipe above or below the water level? Check my pictures above in this thread. Above but plumbed down below. Here's mine. Love it ! I've been running a VS2-24 external for over a decade on my 120. I've got an SVS3-30 running in sump, had it for about 4 years now. Very happy with it. Will try to post some nog shots when I get home. So I recently switched from dosing to a calcium reactor, and back when i was dosing I was getting a lot of precipitate clinging in thin sheets to my sump and unknowingly... my skimmer inside the body! I was looking at it this weekend and notice that even though it still seemed to be skimming fine I noticed that I didn't seem to have as many bubbles in the body of the skimmer. I could actually see the pvc pipe inside the body which is normally obscured by bubbles. So first I ran just the pump in a vinegar bath, but that didn't seem to do anything. Then I checked the whole venturi area and that seemed pretty clean. That's when I had noticed all the build up inside the skimmer. So i broke it all down and started hosing out the body. I had sheets of calcium carbonate or whatever it was falling out in big flakes. After getting all of that out of there, I put it all back together and ran it in a vinegar bath for around 4 hours. After that I opened it all back up and wiped it all down, all squeaky clean. Once that was done I put it all back in my sump and started it up. BAM! The body was completely thick, milky white... completely opaque with bubbles. This was like 10pm at night. By the next morning I had a half inch of nog in the 8" cup. Might have had more but I had accidentally left the drain valve open. Oops. Dennis,where in the skimmer body did you get the buildup? 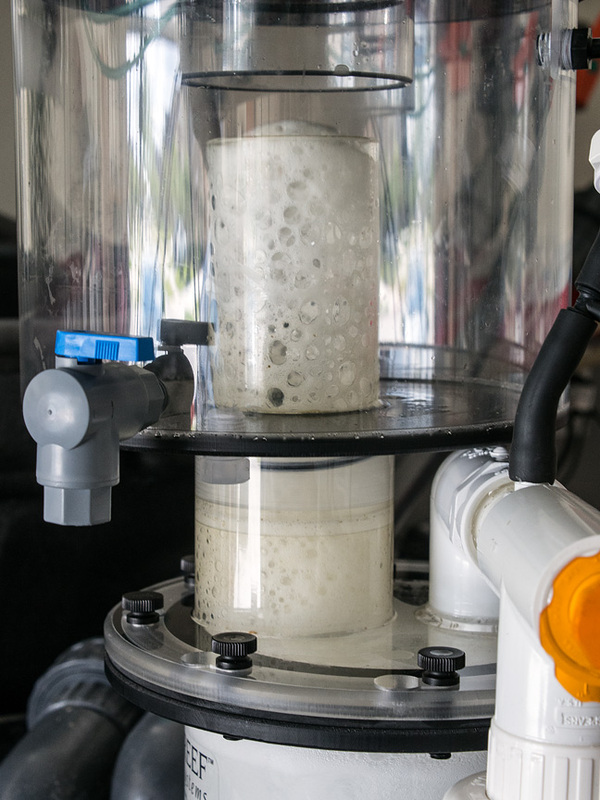 Maybe you can have the output of the reactor downstream of the skimmer (output in the evaporation side of sump) and maybe this will help. Ken, this was from my two-part dosing, not the cal reactor. I was getting it in the sump, too but not anymore.